Lazy Rivers constitute another waterpark feature increasingly finding its way in today’s backyards. Learn what’s involved in this first part in a series. There’s little doubt that lazy rivers remain largely the domain of commercial properties, such as waterparks and leisure pools. 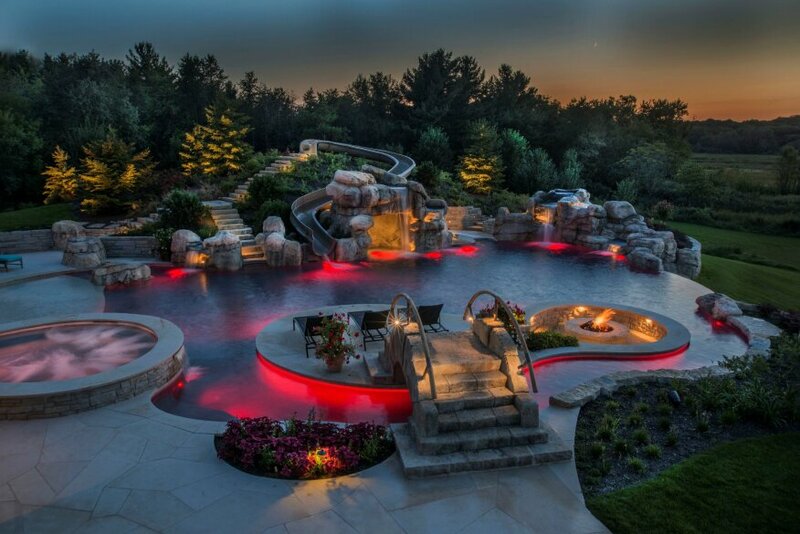 But nobody disputes another fact: high-end pools are becoming crazier and crazier. And homeowners want to enjoy some waterpark-style amenities in their own backyards. That’s why Peter Davidson, president of Current Systems, a manufacturer of products used to move the massive amounts of water in lazy rivers, is seeing more residential requests. Last year brought 30, and this year alone has seen 15 to 20 quotes. Sure, those are small numbers in some contexts, but for residential lazy rivers, it’s huge. This type of installation requires that builders adopt new mindsets in some respects, and employ common sense in others. It becomes especially important as no design standard exists for this type of feature. Here, professionals share their advice. In some respects, these projects are vastly different from regular pools. Running a lazy-river system entails moving tens or even hundreds of thousands of gallons of water at typical speeds of 1 to 3 miles per hour. This will not happen with your standard pool circulation or even waterfeature system. Generating such high flow rates often is achieved using low- or medium-head pumps, which must be placed differently. Estimating the space needed may prove difficult at first. Vaults may be needed so non-self-priming pumps can be placed near water level. Plumbing sizes will hover in the 10- and 12-inch range, so even predicting how much area to give can be difficult, says Rick Chafey, co-owner of Red Rock Pools & Spas in Mesa, Ariz. So, even after a builder gets one or two of these features under his or her belt, they likely will not become regular fare for residential builders. That’s why professionals should plan to seek assistance with every installation — especially at the beginning. The scope can affect all aspects of the project. For instance, they generally need an atypical amount of electrical power, likely requiring a power upgrade to the standard residential property. Designers and installers also may find themselves exposed to different code requirements for equipment, since it often will have to be placed below-grade, necessitating submerged electrical applications. And filtration will need to be accomplished separately. Trying to use the lazy river system for filtration is not efficient or, in some cases, viable. The river system should not operate unless the feature is in use, because it requires so much power and is pushing considerably more water than is necessary for mere filtration. In many cases, using the river system for filtration isn’t even possible. If they’re powered by low- or medium-head pumps, then the back pressure created by the addition of heaters, automatic sanitizers and other features must be avoided. The filtration system will require its own inlets and suction outlets. Some designers use skimmers, others won’t. If so, they must be carefully placed so debris doesn’t zip past them with the current. While the river system isn’t appropriate for circulation, sometimes it can help disperse chemicals when you need it done quickly, Chafey says. A lazy river isn’t much good unless it sprawls. That’s why Chafey doesn’t generally propose one unless he can get at least 50 or 60 feet of length. Still, Davidson says, a designer can get the job done with a 30-by-45- or 30-by-50 plot of land. “The initial misconception is that it has to occupy an extremely large footprint, and it really doesn’t,” he says. If space is a concern, designers can employ creative solutions to make the most of the space available. David Peterson, president/CEO of San Diego-based Watershape Consulting, recommends creating a loop with the river, then using the resulting island inside for something useful. It could serve as a nice getaway with a spa or lanai area to replace entertaining area that otherwise would have abutted the house. Designers must walk a fine line between using up more space than necessary, and short-changing the feature. 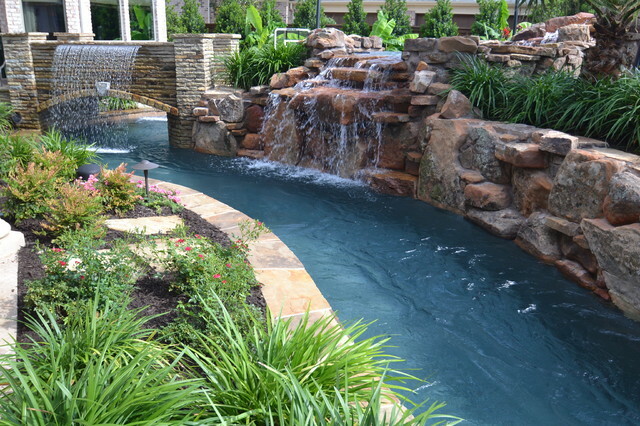 Generally speaking, lazy rivers have a minimum width of 6 feet, with depths starting at 3-1/2 feet. This can largely vary, depending on how clients plan to use it. First of all, what will they use to float on? Will they use inner tubes or larger air mattresses? Do they want to float in single file, or have little party cliques sailing down the stream together? You want to leave enough room to make sure the devices don’t bounce off the sidewalls all the time. This sounds straightforward, but some clients have difficulty describing their visions. But persist with questions. “Really try to get into their heads and get them to imagine what the experience they’re after is going to be,” Davidson says. Also find out how long they’d like to take going down the river. A laid-back ride might require a rate of 1 or 2 miles per hour, while something slightly jauntier would take closer to 3 mph. For the sake of safety and comfort, also find out how high clients want the water to come up on children. They will be trying to board a mat in moving water and push into the current, so they may not want much depth, Davidson says. To ease entry in the stream, it also can help to create a separate loading/unloading space. This can be a simple bump-out where the water is more calm and shallow. “It’s practically impossible to drop the inner tube into the lazy river while it’s running and then jump in,” Benedetti says. He likes this section to measure 12 to 18 inches deep. It should veer on the deeper side if homeowners will use inner tubes: Hindquarters protrude through the hole and could drag on the floor without enough lift. More than 18 inches may make children nervous. Access stairs that protrude, on the other hand, may not be a great idea, Peterson says. These sometimes can work on residential applications, where there will not be too many users. But designers must take care: You wouldn’t want stairs placed near one of the river system’s outlets, or other spots where the water is expected to move faster. They probably should be recessed, too, to avoid any collisions. When it comes to constructing the shell of a lazy river, the same methods apply. As with regular pools, the wall’s thickness, steel schedule and other factors will have to do with site conditions. There is one difference, however, which comes from the sprawling nature of these features. A soils specialist should come onsite and take more borings than he or she normally would for a regular pool. Because of the additional real estate, there is an increased chance of differential soil conditions, where spots in the feature show different ground characteristics, potentially leading to uneven settling of the structure. “When you complicate things with a lazy river, that might challenges things a little bit,” Peterson says. “There should be additional testing for that." Safety also becomes a factor in building the structure and surrounding features. While people will move down the river at a leisurely pace, it’s still fast enough to hurt if they should crash or scrape against a static element. When laying out the river and peripheral features, be sure to place, size and elevate elements so they don’t get in the way. Generally speaking, rocks should not hang over the coping into the river. Exceptions may be made for very round and smooth rocks and boulders that protrude so slightly they won’t get in the path. For the most part, they should stay out of the course. Bridges are attractive features on rivers, as they create access over the water and into your separate spa or entertainment space. Keep in mind that bodies — and heads — will be bobbing underneath, so clearances should be allowed for. When drawing out the course itself, avoid abrupt changes in direction. All curves should be fairly sweeping in nature, so that rafts and the current can smoothly glide in a controlled manner without hitting into walls, which can result in injury to humans, and eddies from the reverberating water. If the river needs to make a 90-degree change in direction, plan to do this with a radius in the neighborhood of 8 to 10 feet, Davidson says. Stay tuned for a second feature, which will provide an in-depth look at the hydraulics of lazy rivers. This article was originally written by Rebecca Robledo and appeared here.